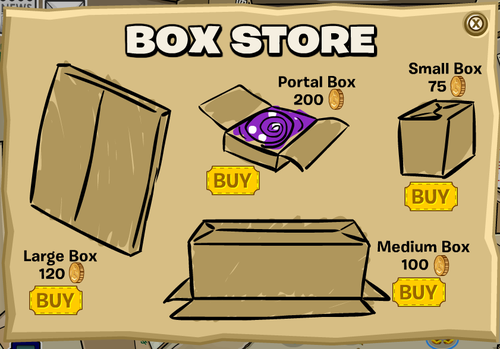 The Box Catalog was located in the Box Store, which was a special room during the 2009 April Fools Day party. The Box Catalog had four boxes in it – all furniture items. The Portal Box is a special item. If you bought it and place it in your igloo and then waddle onto it, it will take you to the Box Dimension room. Where is the box store? The box store came in the 2007 April Fool’s Party. It was only on Club Penguin for the April Fools Day Party.